This salad doesn’t need much in the way of an introduction (it speaks for itself! ), so I’ll just say a couple quick things. First off, I am going to declare that this is the perfect fall salad. Apple season is in full swing, and it seems that every apple I bring home from the farmer’s market tastes better than the last. This salad is such a nice way to highlight apples, as the flavor of the apple works so nicely alongside the earthy kale and the salty fontina cheese. The flavors are so simple, and yet so elegant. Secondly, for those of you who are doubtful about eating raw kale: do not be afraid! Raw kale is surprisingly delicious. It has a very unique and earthy flavor that I just adore. I am not sure why so many people insist on cooking kale prior to eating it! (Of course, cooked kale is also delicious, I’m just saying that it also is wonderful in its raw form.). That being said, I love that this salad highlights how special raw kale really is. And, lastly, I must praise this salad simply because I always feel so great after I’ve eaten it. In addition to being a wonderfully light and simple salad, it is also full of vitamins and nutrients. This really is simple, local food at its best. So, celebrate the apple season with a big bowl full of this goodness. Slice the kale very thinly (i.e. chiffonade), as if for a coleslaw. Core the apples and slice thinly. 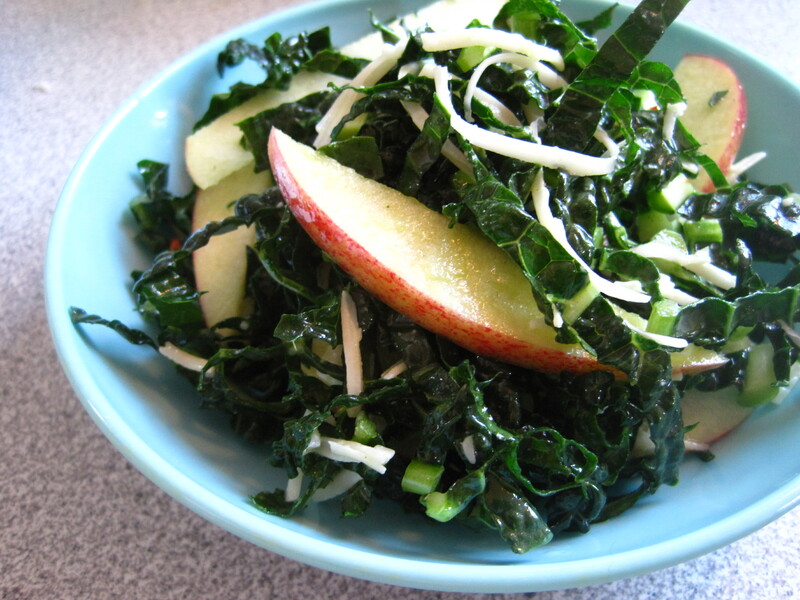 Toss the sliced apples with the raw kale. Mix together the lemon juice, cider vinegar, olive oil. Add in salt, pepper, and chili flakes. Toss the raw kale and apple with the dressing – be sure to start light on the dressing and take care not to ‘overdress’ the salad. Toss in the fontina cheese. Adjust seasonings if needed (I found it needed a little extra salt, pepper, and chili flakes). And that’s all! Can be enjoyed immediately. *I thought about mincing up a clove or two of garlic to stir in with the dressing, but I decided to hold off on the garlic this time. I wanted clean, simple flavors. However, I think that the kale can handle a bit stronger flavor and so next time I’ll add garlic and see if I like it! it is now time for the holiday editions of your blog. you best be ready to bring it! heck yes its time for holiday recipes! and when am I going to get that Crack Pie post from you??? Hello salad! This looks delicious. I am going to imagine that this is what I’m having for lunch. i just made this and krispin was all like–i am not going to like this–and then he tried it. and he loved it! way to help us use up all that kale, linds.